Calling all you beautiful pun lovers! Yes it’s that time again- I’m dusting off my joke book, striking up the house band and engraving another trophy as it’s time for the 4th Annual Champipunship at the 02 ABC in Glasgow. Anyone who knows me knows that I love a pun. And if you know that then you will know that I love this event. 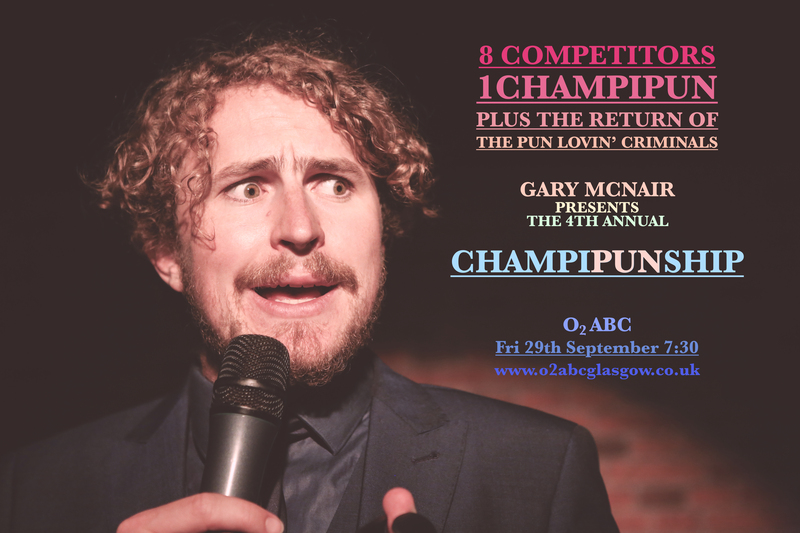 The Champipunship is an evening of wordplay and highly competitive silliness originally started as a fundraiser to take Donald Robertson Is Not A Standup Comedian to the Edinburgh Festival Fringe in 2014 but such was the popularity of the event, it is now as a night of entertainment in it’s own right. The evening is simple. There are eight competitors who will be whittled down to two in a series of wordplay challenges including the wonderful picture and music rounds. I’m delighted to confirm that this year the music will, once again, be performed by our ridiculously talented house band The Pun Lovin’ Criminals who have brought you such classic mashups in the past as The Randy Newman League, Van Morrissey and James Taylor Swift. The night can get heated, it will get tense, there will be laughs, there will be devastating groans and most importantly there will be plenty of opportunities for everyone in the audience to get involved and prove once and for all just how good you are at puns. Speaking of getting involved- if you fancy yourself as a potential Champipun, then make yourself known. Spaces are filling up but if you would like to compete, or you know someone else who would, then please contact me by EMAIL me@garymcnair.co.uk or on TWITTER at @thegarymcnair as there are still a couple of spaces left to fill. Who knows, you may be the next champipun of the word. So, spread the word around your street, office, uni, family, friends and why not bring someone from the EU to show you love them and you still care.